Railway stations in India are a carnival-like hive of activity, where swarms of passengers and well-wishers blend with a multitude of vendors. Waiting at the wrong platform, or even at the wrong end of the platform, could spell disaster when the train may only remain at station for a couple of minutes and you're burdened with a lot of luggage. Standard passenger trains in India have 18 carriages, increasing to up to 24 carriages on popular routes. Don't even try to imagine what it would be like to be stuck at the wrong end of a crowded platform when the train stops! The main issue is that Indian Railways only declares a train's platform number a few hours in advance. The platform number may also be changed, adding to the confusion. Here's how to go about finding and boarding your train. Thanks to technology, nowadays you don't need to wait until you arrive at the railway station to find out train information. Indian Railways' National Train Inquiry System provides the expected platform number and live running status of trains. It is available as a cell phone NTES app. India Rail Info is another useful website, as it shows the order of the train's carriages (search by train number and see "Rake/Coach Position"). This will help you determine the location of your carriage (coach) at the station. Obtain your coach number from your ticket (for example, A1, B1, or S1) and make a note of the related number. Alternatively, Trainman is a user-friendly website and app that provides train information including the train's usual platform (look under "Timetable") and coach position. Firstly, find the platform where your train will arrive. If you haven't already looked it up online, check the train details on one of the large screens that are commonly situated near the railway station entrance. If in doubt, ask a railway employee. Next, find the particular spot on the platform where your carriage (coach) will be. You'll notice a row of boards with numbers suspended from the roof at regular intervals along the platform. Each corresponds to a particular coach. These days, the boards at major stations are mostly electronic and specify the actual coach number, such as A1. However, at smaller regional stations, the boards may be static and only show a series of numbers 1, 2, 3, 4 etc. If this is the case, look for a board that indicates the layout of the train and see which number your coach is. (Or, check online as mentioned above). Position yourself at the number of your coach on the platform and you'll be in the right place when it stops. Still confused? Ask one of the vendors on the platform. They have great knowledge of the trains and usually know where each carriage will be located. Each train carriage (coach) has a small board on the outside with its number displayed on it. Make sure that your coach number is shown on the board. If you're brave, be prepared to push your way on the train. Otherwise, it's best to stand back and wait for the masses to board. Inside the train carriage, you'll find that all compartments are numbered. However, don't be surprised to discover that someone's already occupying your place. They'll usually move once everyone else finishes organizing themselves and their luggage. Copies of the Passenger Reservation Chart, setting out details of each passenger and their allotted berth, used to be pasted on the sides of trains. However, this practice ceased in 2018. The charts are still displayed on the platform boards for passengers who want to know who they'll be traveling with. If all this sounds too hard, opt to hire a coolie (porter) who will carry your bags and locate your compartment for a fee. They're plentiful at railway stations and can be identified by their red jackets. However, be sure you negotiate the fee before availing of their services. 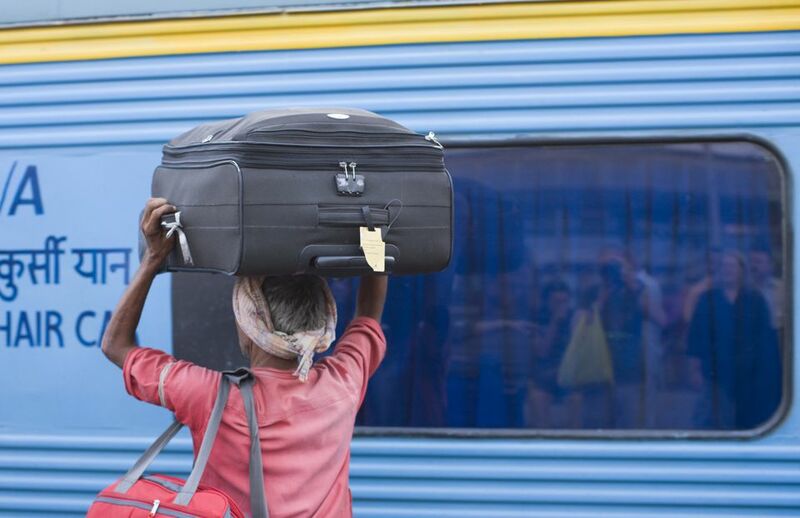 Licensed railway porters do have fixed charges according to the amount of luggage. The rate varies depending on the location and category of station. It starts from 40 rupees for a bag weighing up to 40 kilograms that can be carried on the head. At major stations the rate per bag is 50-80 rupees. However, rarely will porters agree to this. They will usually demand more money, so be prepared to negotiate.